1. Preheat the oven to 450 degrees F. Lightly grease a rimmed baking sheet with olive oil. 2. In a large bowl toss the broccoli ingredients together, seasoning generously with sea salt and black pepper. Mix until well combined. 3. Spread the seasoned broccoli in a single layer over the prepared baking sheet and roast in the preheated oven for 10 minutes. 4. Meanwhile, drizzle the olive oil over the salmon fillets and evenly sprinkle with the minced garlic, lemon zest and dried marjoram. Season generously with sea salt and black pepper. 5. 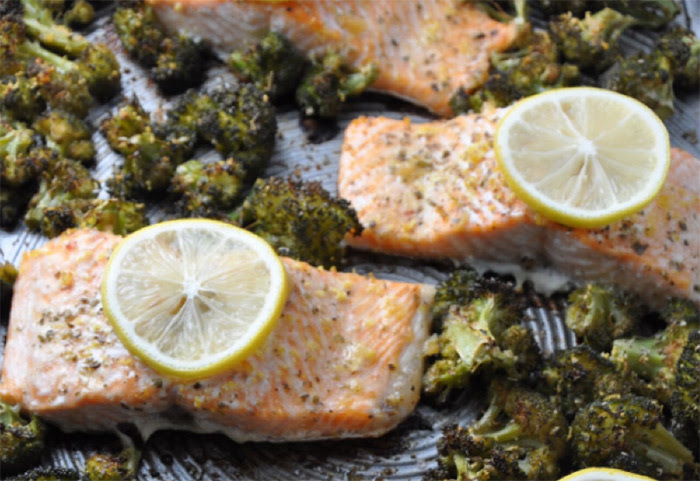 Remove the baking sheet from the oven and move the broccoli to create open spaces for the fillets. Place the salmon in the empty spaces and put back in the oven for 10 to 12 minutes, until the salmon is flaky and cooked through. Top each fillet with a slice of lemon and place under the high broil for 1 minute. Remove from the oven. Enjoy! One serving equals: 401 calories, 19g fat, 12g carbohydrate, 8g fiber, 356 mg sodium, 3g sugar, and 42g protein.